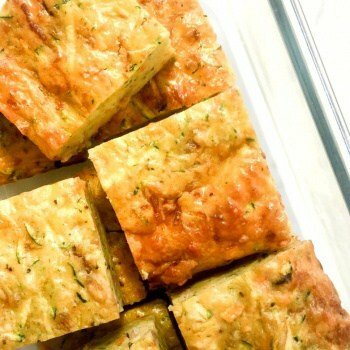 Introducing one of our family’s school lunchbox favorites – the Cheesy Zucchini Slice. It’s super easy to make and the kids absolutely love it! Pop this healthy slice in their lunchbox any day of the week. It is also a really quick and tasty midweek hot or cold dinner option. Preheat oven to 170’C / 340F. Line a baking dish with greased parchment paper or rub a little oil on the dish for a non stick surface. I used a 20cm x 15cm pan and lined with parchment. Heat a pan on the stove stop add onion, bacon and olive oil. Fry for around five minutes until onion is soft and translucent. Add cooked onion, and bacon to a large mixing bowl, add all remaining ingredients and stir with a wooden spoon or spatula until well combined. Place in baking dish and use a spatula to evenly spread out on the dish. Bake for 25 – 30 minutes until lightly golden and firm to touch..
Store in a Tupperware in the fridge for up to 3 days. You can use any flour but it will change the consistency of the slice. If you use a plain flour, don’t forget to add baking powder. The ration is 3/4 cup flour to 3/4 teaspoon of baking powder. You can freeze this slice once you’ve cut into squares. Simply thaw and reheat before eating.